Yes, make this asap, because it’s pretty (that’s not really why). I don’t often blog immediately after I create a recipe, because, well, I’m eating or living life or sleeping-but it’s Friday so yay, I can stay up late! I’m so old. Super stressful, busy week here, and I have about 50 kajillion things I want to blog about, but don’t have the time-sleep is valuable for helping my brain function, or repair. Therefore, I came home tonight, poured myself a glass of red wine, started bacon cooking, had a bite of Theo Chocolate, then starting cooking. In that order. I began by sautéing the onion in the coconut oil over medium heat, seasoning with kosher salt/pepp/garlic powder. 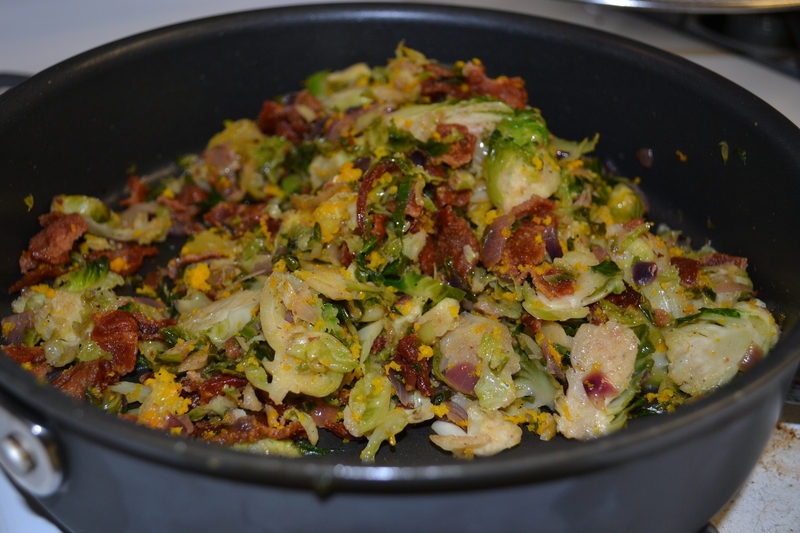 Then I turned the heat down to low and added the entire bag of shredded sprouts, sautéing until cooked, but still crisp. I added the juice of the orange and let it simmer for about 15 minutes. 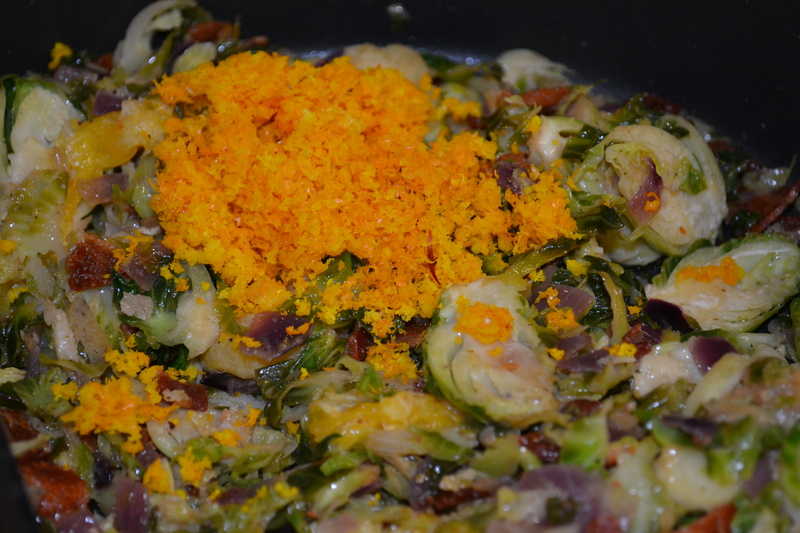 Then I cut the bacon into pieces right into the pan, added the orange zest, and scraped the flesh pieces of the orange out of each orange 1/2. I let everything heat throughout. Then I ate it with some over-easy eggs. What what. Orange happens to be one of my favorite flavors, of all time. It is exceptional with salty, veggie, sweet, chocolate, etc. flavors. Enjoy! 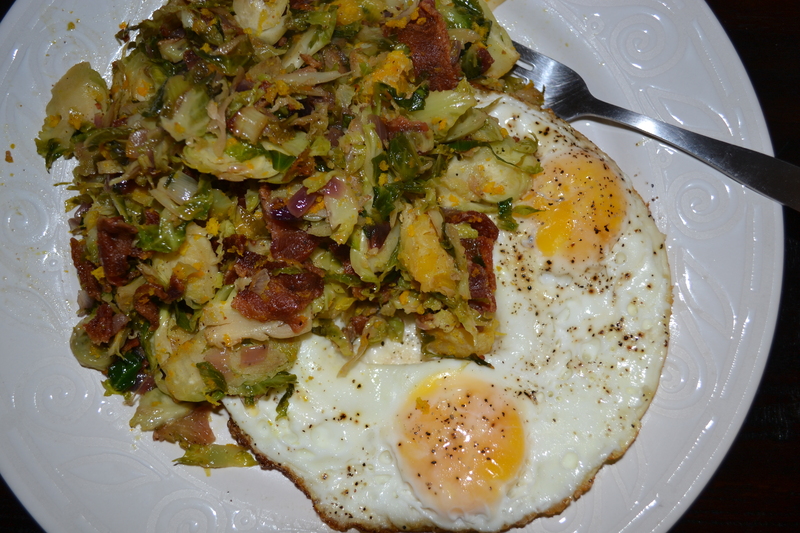 This entry was posted in Recipes and tagged Bacon, Brussels Srpouts, Hash, Healthy Fat, MicroPlane Zester, Orange, Paleo, Real Food, Theo Chocolate, Tropical Traditions Gold Label Coconut Oil by livinglikelinds. Bookmark the permalink.